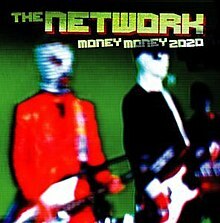 Money Money 2020 is the only studio album by the Green Day side project, new wave band The Network. It was released on September 30, 2003 through Adeline Records. The album came with a DVD that featured six music videos for songs on the album directed and produced by Roy Miles of AntiDivision. It was re-released by Reprise Records on November 9, 2004. This release did not include the DVD, but did include two additional tracks, "Teenagers from Mars" (which also appeared in the video game Tony Hawk's American Wasteland) and "Hammer of the Gods". On April 23, 2010 in New York City, the Foxboro Hot Tubs, another one of Green Day's side projects, covered the song "Supermodel Robots." The song "Roshambo" was featured in the video game NHL 2005, and "Teenagers From Mars" was featured in the video game Tony Hawk's American Wasteland. Members of Green Day initially denied being involved in The Network until 2012, when Mike Dirnt revealed they were in fact the band. Fink - lead vocals, lead guitar, drums on "Hungry Hungry Models"
The Snoo - drums, lead vocals on "Hungry Hungry Models"
Z - keyboards, backing vocals, keytar on "Right Hand-A-Rama"
Captain Underpants - keytar, keyboards on "Right Hand-A-Rama"
^ "Money Money 2020 Review". IGN. Retrieved August 24, 2015. ^ a b "Money Money 2020 - The Network | Songs, Reviews, Credits". AllMusic. All Media Network. Archived from the original on 23 June 2012. Retrieved 31 March 2016. ^ "The Network". MTV. Retrieved August 24, 2015. ^ Cite error: The named reference IDENT was invoked but never defined (see the help page). This new wave music album-related article is a stub. You can help Wikipedia by expanding it.